Panch Kedar is the only pilgrimage journey in the world that requires the pilgrims to worship five Shiva temples in a strict order. The journey to these five temples begins with Kedarnath at an altitude of 3583 m. The second temple of this journey is Tungnath at an altitude of 3680 m, which is followed by Rudranath at 2286 m as the third temple. The fourth temple and the most beautiful one is Madhyamaheshwar at 3490 m followed by the last Kalpeshwar at 2200 m. All these temples are located in the state of Uttarakhand amidst the most beautiful hills in the country. Read on to know more about the amazing Madhyamaheshwar Temple. As the region in and around Madhyamaheshwar experiences extremely cold winters, it is advisable to avoid visiting Madhyamaheshwar during the winter season. However, the best time is from May until the end of October when the weather is pleasant and the climatic conditions are favourable, letting you explore the surroundings of the temple. Madhyamaheshwar Temple is the fourth temple that is worshipped in the Panch Kedar pilgrimage circuit, where the navel of Nandi, Lord Shiva's bull, is worshipped and is believed to be built by the Pandavas of the epic Mahabharata. You can find many legendary tales of these great heroes around the temple which have been passing on from one generation to another. There are several other smaller temples of Shiva, Parvati, Ardhanarishwara (a half Shiva, half Parvati) and Goddess Saraswati. With all these temples at one single location, Madhyamaheshwar Temple creates a very serene and holy vibe that touches every visitor, leaving them with a pristine mind and pure thoughts. Pilgrimage and soul-searching are the two most frequent reasons as to why people visit Madhyamaheshwar Temple. However, you don't really have to be spiritual or religious to enjoy the beauty of Madhyamaheshwar Temple. Situated in a lush meadow just below a high ridge, it is one of the beautiful locations in Uttarakhand that bring a sense of freshness and help in purifying the mind of every visitor. To add on to the beauty of the location, the divine aura that the temple provides its visitors with is also very rejuvenating. Most importantly, as this temple is believed to be built by the Pandavas, it is a very popular hub to learn more about Hinduism and get immersed in the tales of great heroes, gods and goddesses. 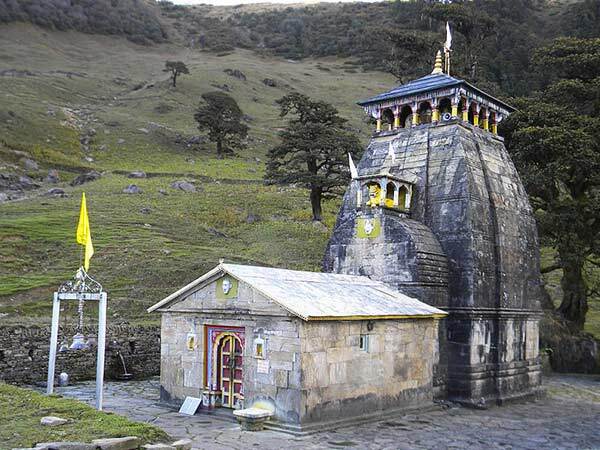 Madhyamaheshwar Temple can only be reached by a trek of around 20 km, which starts at Unaina village in Uttarakhand. To reach Unaina, you can take the following mode of transport. By Air: You can take a flight to Dehradun Airport and then from there you can hire a cab to Ukhimath. From Ukhimath, you can hire a cab to Unaina village. Madhyamaheshwar Temple is located at an approximate distance of around 200 km from Dehradun Airport. By Rail: The nearest railhead is at Rishikesh which is at a distance of around 170 km from Ukhimath. You can catch a train to Rishikesh railway station and then from there you can take a cab to Ukhimath and further to Unaina. By Road: Unaina is easily accessible by road. Once you have reached Unaina village, you can start your trekking journey.